Wow! The 3rd and last day of the Scrum Gathering in Seattle was epic! I am tired and thrilled to have participated in such a great day, and such a great conference. Thank you to all who made this happen. This was something that I had some reservations about. What does this mean that we all decide what will happen and how it takes shape? However, this was, by-far, one of the most interesting and engaging parts of the entire conference. Here are the 4 principles of Open Space: (1) The right people show up (2) Whatever happens is the only thing that could (3) It starts when it starts (4) It’s over when it’s over. There is one law to Open Space: If you are not learning or contributing where you are, find a place when you can learn or contribute. And there are two roles in Open Space: (1) Bumblebees – these people bounce around to other sessions and add new ideas. (2) Butterflies – these people sit somewhere and look beautiful, and may not attend sessions. I guess that I was neither a bumblebee or butterfly, like most of the participants. So we were encouraged to come up with topics that we wanted to facilitate and/or learn about and pick a time slot and location. This happened quite naturally – which was added to the marketplace for the participants to choose which sessions they would like to attend and contribute to. This is the first time that I had the privilege of seeing Chris in action. He is a dynamic and very effective teacher and facilitator. The game is another method for teams to estimate effort for User Stories (in Scrum) or Value Drivers (in OpenAgile) or whatever you use for your particular Agile method. He had us form small teams to estimate effort on consuming various types of fruit (which were on cards) including: grapes, orange, durian, pineapple, apple, blueberries, pomegranate, and coconut. Step One: This was carried out by each person taking turns and doing one of two things: (1) placing a new card on the wall or (2) changing the position of one card. This was pretty easy and allowed us to have conversations on what we meant when we did an action. Step Two: Then the team had to add numbers (also on cards) as a way to categorize the effort that would be done. Now each person had three options: (1) place a new card number, (2) moving a single card on the wall, or (3) passing which means that you agree with what is currently on the wall. Roger showed us a few things to keep in mind when helping to launch an Agile team (usually done by him in a 3 day training on-site). A ScrumMaster or Coach has certain things to do during the various stages of a team’s development: (1) in Forming, he needs to be directive and tell the team what needs to get done, (2) in Storming, he needs to focus on conflict resolution for the team, (3) in Norming, he needs be a facilitator and observe and then offer ways to improve, and (4) in Performing, he either needs to work on organizational obstacles or move on to another team. Roger explained how the constant sprint length for a team helps it to get into a rhythm and get data such as the team’s velocity (the speed at which it gets things done). 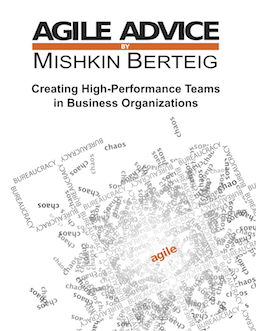 He also offered a great tool for people to use called the Market of Skills which comes from Lyssa Adkin’s book “Coaching Agile Teams”. Other things to use include a team working agreement, team vision, and a definition of done. He said that he likes to spin up 2 or more teams at a time to that they can learn from each other. Skip made this session very collaborative and got us to add own challenges and questions to a flip chart page and then get us to share how we would solve each others challenges. Insights included: share visual stories to help the team see benefits, promote outcomes, tools to use for collaboration. Some tools and useful sites: http://sococo.com, http://onemoreagileblog.com, http://cocoo.com, and http://agileadvice.com ! Here is the format that he shared for a User Story: As a (type of user) I want (something) so that (value). Enter the things within the parentheses ( ). Here are the 4 techniques for splitting stories that he shared: (1) Conjunctions / Connectors – words such as if, and, but or even commas. (2) Generic Words – eg. activities which could be broken into sports, dancing, and board games. (3) Acceptance Criteria – which is a list of pass/fail items that if agreed the story is done. (4) Time-line – which are steps of sequence to get something done. I spoke for a few minutes with Chris. We talked about David Parker who used to work at Berteig Consulting (where I work) and now works at Agile Learning Labs (where Chris works). Chris had nothing but praise for David! Each person shared something that they like or enjoyed about the conference. I shared three things: (1) the humility of the Certified Scrum Trainers (CST) and the Certified Scrum Coaches (CSC) to share with all of us their knowledge and their ears, (2) the wisdom of everyone at the conference, and (3) the amount of smiles and laughter that was the reality of all of us who attended. Joe gave an epic keynote on his team that built a car that gets 100+ MPG. It was amazing and super inspiring! I don’t even know what to say about it. He and his distributed, collaborative, and highly Agile team of volunteers did incredible things. I hope to buy one of their cars when I done with my current car. It is that good! So this was my first Scrum Gathering and it was amazing. From the people to the food to sessions to the Open Space to the Certified Scrum Trainers and Certified Scrum Coaches to the people who it made run so well – Fantastic! I hope to attend another Scrum Gathering in the near future. I already plan on attending the one in London, England in October 2011. Previous PostPaul @ Scrum Gathering Seattle – Day 2 Recap #sgseaNext PostAgile Jobs in Beautiful Saskatoon!